If you love to camp or tailgate, then being able to take a grill with you when you is likely part of the experience. These days a lot of campgrounds and stadium tailgate areas are banning charcoal grills due to the potential fire hazard. Not to mention lugging charcoal and a proper means to extinguish the fire afterward can be a bit of a hassle. 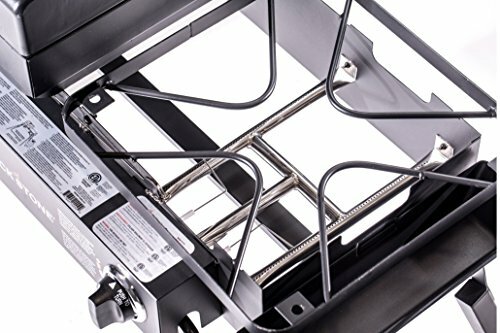 Blackstone designed their 1555 Tailgater to be a go-anywhere gas grill that can meet your needs when you want to grill meat over an open flame. Yet in just a few minutes you can also easily transform it into a large range or a high-quality griddle. This means it is just as capable of grilling up a mess or burgers and brats in the stadium parking lot, as well as making bacon and French toast for a hearty campsite breakfast. Blackstone understands how important portability is. They designed the legs and patented them at the United States Patent office. They have the ability to fold up flush under the grill body. When they are unfolded the legs can telescope out to increase the height. 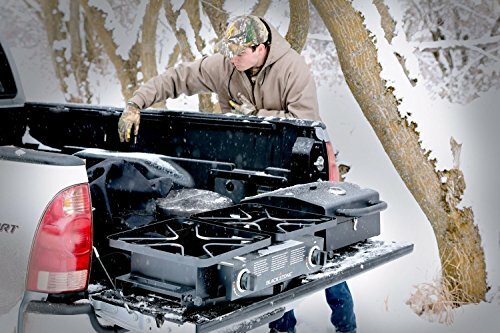 This allows you to set it up as a standing cook station, a seated cook station, or simply letting it sit on the open tailgate of your pickup truck. The Blackstone 1555 Tailgater weighs in at 75 pounds. This is maybe a little bit too heavy for the average person to move on their own, yet it’s not going to break your back. 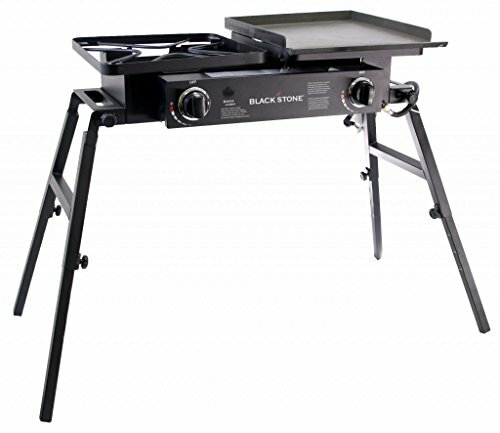 Blackstone has spent years developing a reputation for offering quality grill, griddle, and camp stove products. This holds true with the Tailgater. All the metal components are heavy duty, with quality welds and fasteners throughout. Blackstone further backs this up with a satisfaction guarantee. The grill grates are made from porcelain coated cast iron. The griddle is made from cold rolled steel. The entire frame has a durable layer of powder coating on it. Assembly is easier than you might think for a unit that’s this versatile. Still, there are some technical parts to it, so take your time reading the instructions from front to back. It shouldn’t take you more than an hour to an hour and a half to fully put the Tailgater together. If you aren’t mechanically inclined, there are some online retailers who offer an expert assembly service, at a reasonable price. 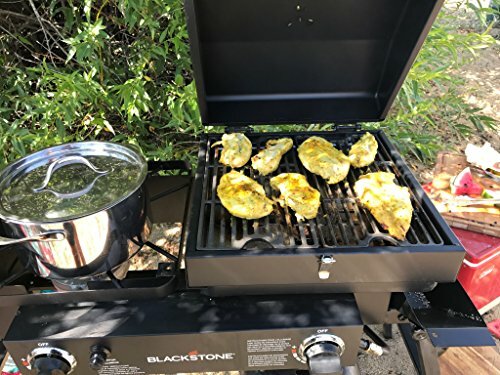 The Blackstone Tailgater has several different configurations to consider for what you want to prepare and where you want to prepare it. The most common setup is to have a large burner on the left-hand side, and either a grill or a griddle on the right-hand side. This will allow you to say boil a large pot of water for corn on the cob while grilling up some steaks or frying some bacon. If you prefer it is possible to set it up as a grill on both sides. 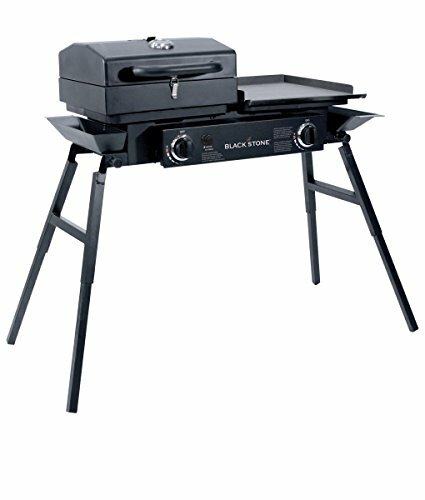 The Blackstone Tailgater even comes with a half grill hood. In this configuration, you could say grill some bone-in chicken breasts over low heat, under the grill hood, while you make steaks over the high heat grates on the right-hand side. One thing you need to consider with this type of configuration is that the left-hand side has a large stove top burner element. When you use it as a grill, it is bound to have hot and cold spots. 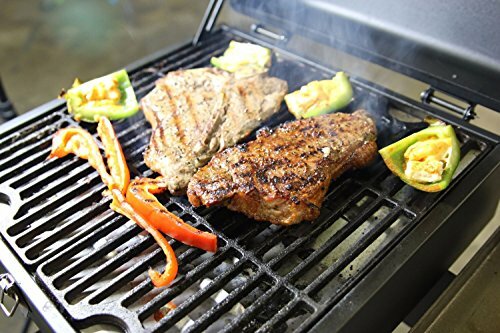 Meanwhile, the right-hand side has two stainless steel propane grill elements like you would find with any other gas grill. 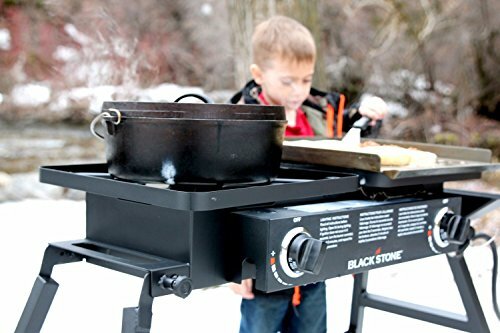 Each side of the Blackstone Tailgater measures 16” by 16” for 256 square inches each. Depending on how you configure it, you can have a maximum of 512 square inches of cooking space. The patented folding and telescoping legs allow it to sit flat on the tailgate of your pickup truck on top of a picnic table. Yet when they are set up, they also provide the Tailgater with a sturdy base. The ability to configure it as a grill/griddle, burner/burner, griddle/grill or a wide-open gas grill really allows you to take the convenience of a home kitchen with you when you are on the road. How you configure the Tailgater will influence just how much work it is to clean up. The grease management system of the griddle side can be a little slow and needs an eye kept on it when you are cooking. The cast iron grill grates are covered in a non-stick porcelain coating, which makes them easy to scrape down. One small, but acceptable knock on the gas burner elements of the right-hand side, is the lack of heat deflectors or baffles. This means that grease drippings and things like marinade runoff can potentially land on a burner element to gum up a few of the flame ports. Should this happen, you can use a wooden grilling skewer or a sturdy, round toothpick to clean the gummed up ports after you are done cooking. The Blackstone Tailgater comes with a 90-day part and quality warranty. On face value, this seems a little light compared to the competitors. However, Blackstone does have a long-standing reputation for quality and customer service. They claim to offer a “Satisfaction Guarantee.” So, if you do end up having a problem later on down the line, chances are good that their stellar customer service staff will be able to offer you the fairest deal possible. 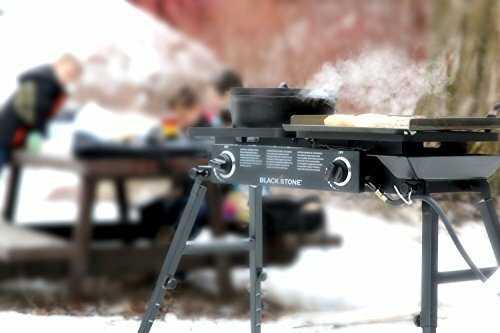 If you need a go-anywhere, do-anything grill, griddle, and camp stove combo, then the Blackstone Tailgater should be at the top of your list. The different ways it can be configured and the convenience of using it is sure to get your creative culinary juices flowing for your next trip. At the same time, this unit is completely comfortable living on your deck as your daily griller. PORTABLE - The perfect tailgater grill and griddle for any event. Easy portable setup, almost no assembly required, ready to use in seconds. Take it to the park for an afternoon cookout or take it into the woods for a long-term camping trip. The easily adjustable legs will be stable on uneven ground and make setup a breeze. VERSATILE - enjoy several different setup combinations. Utilize the grill box and griddle at the same time or easily remove both and use the two open burners for pots/pans. You can also keep the grill or the griddle on and have one open burner... so many options! 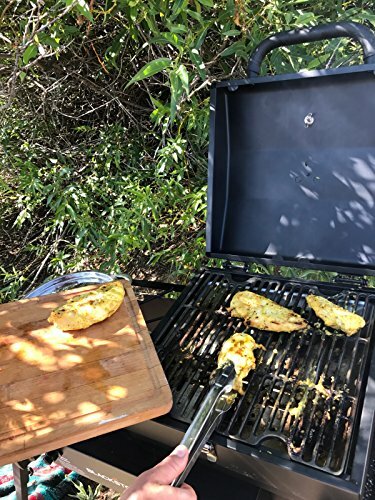 With a gas grill and/or griddle, you can cook and barbecue however you want, enjoy cooking a variety of food on one easy to use tailgater combo. 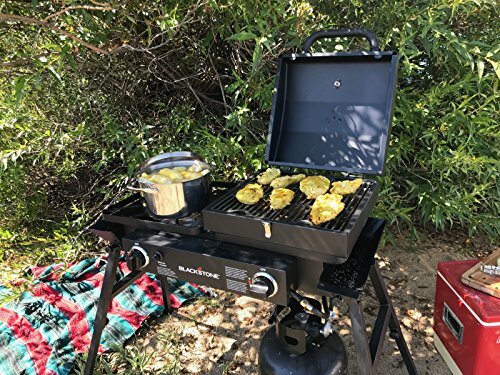 DURABLE - Built to last this Blackstone grill includes a heavy-duty grill box with vent, handle and durable cast iron grill grates plus a cold rolled steel griddle plate and the whole unit has a strong powder coat finish. TWO BURNERS - two independently controlled burners (1 stainless steel H tube burner and one cast iron burner). The H tube burner can put out 15,000 BTUs and the cast iron burner can produce 20,000 BTUs. SATISFACTION GUARANTEE - if you are not completely satisfied at any point please feel free to contact Blackstone directly or return the product. Blackstone stands behind their product large or small and guarantees your satisfaction!